Lifestyle TV network focused on diversity presents live TV Awards & Gold & Purple Carpet Banquet Luncheon. 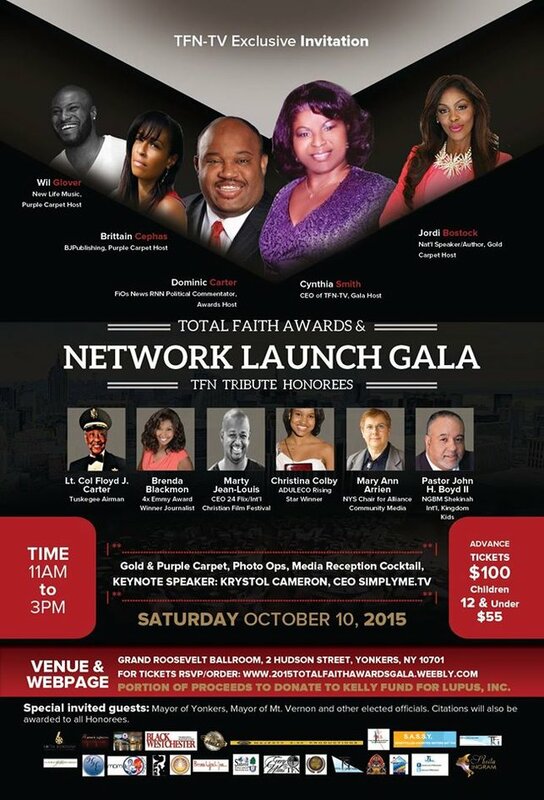 Yonkers, NY - September 14, 2015 - On Saturday, October 1, 2015 County-based Lifestyle TV Network focused on Diversity Presents Live TV Awards & Gold & Purple Carpet Banquet Luncheon; Media A list to attend October 10, 2015. Social media advances and similar "patterns of disruptive" media are proof that the production and sharing of content is becoming increasingly democratized. Now, a bold, fresh news engine joins the demand to be heard crowd of media outlets -­ Total Faith Network. A live TV broadcast and banquet luncheon will be held officially kicking off the entertainment, lifestyle and news network at the historical Grand Roosevelt Ballroom in Yonkers on Oct. 10, 2015 from 11 a.m. - 3 p.m.
Buy tickets now here. Portion of proceeds to donate to Kelly Fund For Lupus, Inc.
Subject: LongIsland.com - Your Name sent you Article details of "Westchester County-based Lifestyle TV Network Focused on Diversity Presents Live TV Awards & Gold & Purple Carpet Banquet Luncheon"